If you’re looking for a healthy organic basket this Rosh Hashanah, then this unique kosher collection is just for you. While most Rosh Hashanah gifts don’t last much longer than the new year itself, this is an organic basket that will be useful all year round. 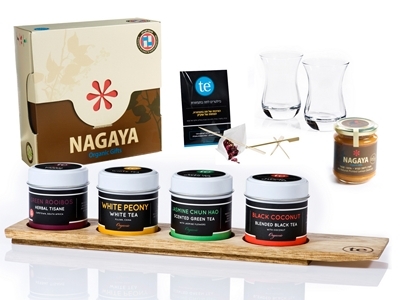 Beautifully presented on a wooden tray, you will find four tins of organic tea for your enjoyment. t is accompanied by a pot of pure honey, made from wild flowers. Meanwhile, the tea filter pack makes it easy for you to use this kosher basket, while the two beautifully crafted oriental glass tea cups ensure that you can drink your Rosh Hashanah cup of tea with a friend. Enjoy this unique kosher gift basket.